How do I generate a project report on demand? This can be done from the project page of the website. There is an icon for “Print Report” on the toolbar at the right-hand side of the project page. 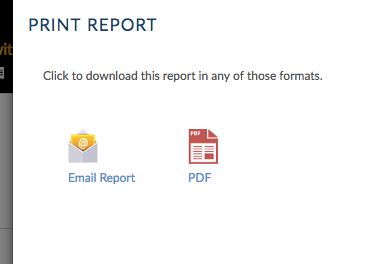 Clicking on this icon presents two options: Email Report and PDF. Clicking on Email Report will send a report to all members of the project, excluding guests, as well as any designated report recipients. To view the report without sending it, click PDF and then click “Click here to view” once it is done generating. You then have the option to print or download the report.